The 2017 ANZMAC Mid-Year Doctoral Colloquium, hosted by Griffith Business School, is open to enrolled doctoral students who are at any stage of their doctoral training. Entry will be a competitive process as the colloquium will be limited to 30 student participants. Doctoral students will submit and present aspects of their doctoral work and receive feedback and mentoring from senior researchers. This doctoral colloquium will also feature presentations by leading world-class scholars including Professor Mark Uncles (University of New South Wales), Professor Sharyn Rundle-Thiele (Griffith University), and Visiting Associate Professor Sameer Deshpande (Department of Communications and New Media at the National University of Singapore). The co-chairs of the Doctoral Colloquium are Associate Professor Krzysztof Kubacki and Dr. Denni Arli. Feedback from established scholars in your area of research: Participants’ proposal will be reviewed by two scholars within their field (or as close as possible) and feedback will be provided following the presentation at the Doctoral Colloquium. Participants will each be given 15 minutes for their presentation and 15 minutes for feedback, questions and discussion. Partake in peer review and build your network: Participants will be placed into peer groups based on similarity of topics or research methods to be able to participate in relevant presentations and discussions. This is designed to enhance peer-review skills and facilitate networking. Participate in workshops: Several presentations and discussions will be held by world class academics covering topics such as advancing your early career, juggling work and leisure and living a creative, fun and sustained academic life and working outside academia. A full research proposal which may include literature review, methods, data collection and findings for those wishing to enter the Late Track (10 to 20 pages maximum, including references). An extended abstract for those wishing to enter the Early Track (maximum 5 pages, including references). o Three key concerns or questions you would like reviewers to consider when they critique your proposal. Spacing: Single Spaced, with one blank line between paragraphs. ANZMAC Conference Travel Awards for Doctoral Students are offered to participants in the Doctoral Colloquium. Up to four awards are available to assist full-time doctoral students who wish to attend the Mid-Year Colloquium and need funding to do so. Applicants must be studying at an institution that holds Institutional Membership of ANZMAC. Submissions require a one-page justification for why and how much funding is required to be included with the submitted proposal. Selection will be based on proposal merit and justification of funding needs. Participating in the Colloquium offers the opportunity to win the ANZMAC Mid-Year Doctoral Colloquium Best Paper Award. The selection for the ANZMAC Doctoral Colloquium Best Paper Award is based on the quality of the submitted proposal and the students' presentation during the Colloquium. The Doctoral Colloquium fees will cover coffee/tea breaks and lunches, entry into parallel sessions, keynote speeches, and the Colloquium Dinner. Griffith University, Southbank Campus. Griffith's South Bank Campus is ideally located in Brisbane's picturesque South Bank Parklands. The campus is only a 10-minute walk from the Brisbane CBD and is adjacent to the Queensland Art Gallery, Gallery of Modern Art, the State Library, Museum, Performing Arts Complex and the Brisbane Exhibition and Convention Centre. Address: 226 Grey Street, South Bank, Qld 4101. 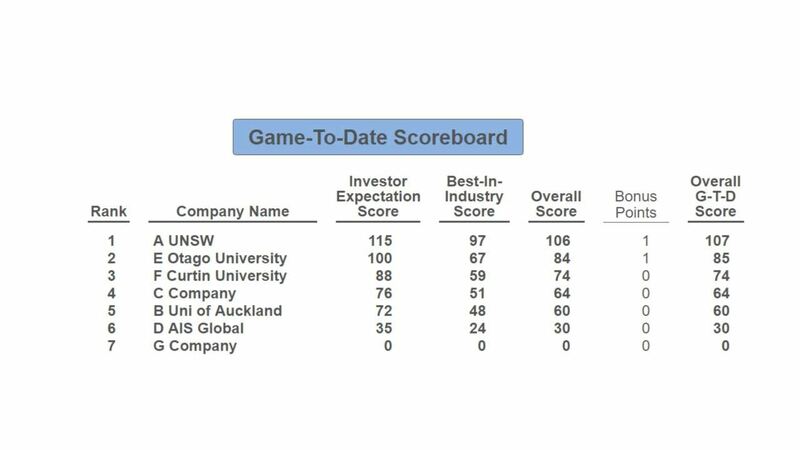 The 2017 ANZMAC Strategy Challenge kicked off on Sunday February 19, with six teams from Australasian universities competing to become the inaugural challenge champions. After two preliminary rounds, where teams became familiar with the online simulation application being used, we saw the completion of the first of ten competitive decision rounds. It’s early days yet, but the UNSW team got out of the gates early and has already put some distance between themselves and the rest of the field. Are they on a winning strategy? Time will tell. Check back for regular updates on team performance and industry manoeuvrings as the challenge progresses. Institutional membership entitles your organisation's staff and students to be nominated for ANZMAC awards, provides staff and student discounts at the 2017 ANZMAC conference, and offers you opportunities to become more involved in our community. If your institution is not listed here, please get in touch with the ANZMAC Secretariat or go to ANZMAC application/renewal. If you have an article or announcement that might be of interest to ANZMAC members, please email ANZMAC Secretariat, Claire Lloyd.